Recent developments have revealed that: (i) advanced transition countries have received most of the FDI to date, especially greenfield projects; (ii) more countries than in the mid?1990s are resorting to FDI in order to accelerate privatization (Czech Republic, Poland and Slovakia); and (iii) countries in South-Eastern Europe are lagging behind in terms of attracting FDI. The impact of FDI on the balance of payments shows that this inflow of capital also creates related outflows. 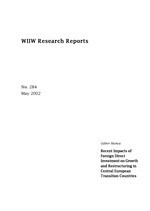 It can further be seen that: (i) FDI may increase the trade deficit and the service sector deficit; (ii) FDI-related income outflows may become high; and (iii) problems related to deficit-financing can be avoided by maintaining a country's attractiveness to further investment and encouraging export-oriented investments and spillover effects. With respect to the impact of FDI on the government budget, we conclude that: (i) FDI incentives are no substitute for a favourable investment environment; (ii) general investment incentives do not solve regional and labour market problems; (iii) government revenue increases in the wake of FDI on account of high profit rates in the foreign sector; (iv) government revenues can be lost on account of tax allowances; and (v) economic growth and income generation through FDI increase the tax base. Structural change in manufacturing is closely linked to the penetration of foreign capital. Most recent 1999 data show that (i) foreign penetration is high in Hungary and increasing in Poland and the Czech Republic, while remaining low in Slovenia; (ii) the foreign sector enjoys advantages in terms of labour productivity, export propensity, investment propensity and profit rates; (iii) Hungary lies ahead of other countries where the upgrading of export structure is concerned; (iv) the foreign sector specializes in high-tech and export-oriented industries, the domestic sector in low-tech and domestic-market-oriented industries, thus leading to the emergence of an unhealthy duality; and (v) research confirms the existence of technology transfer through FDI, but finds no productivity spillover to the domestic sector.